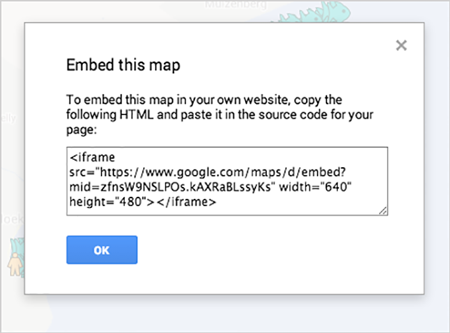 First, make sure your map is Public on the web. Share button > Who has access > Change > Public on the web >Save. Go back to your map and select the map menu pulldown, indicated by three dots next to the Share button. Select Embed on my site. Copy the HTML and paste it into the source code of your website. Note that you can customize the height and width of your map. Tip: You can set a default view for the map. This gives you extra control over what portion of the map will be on display when a viewer first visits your map. To set this feature, position the map in your browser. Then go to the map menu pulldown, indicated by three dots next to the Share button, and select Set default view.